MSUToday Presents: "Cuba: Opening Doors"
Michigan State University students and faculty spent time in Cuba on a study abroad trip to experience Cuba's culture and music. Dr. Paul Kan delivered a talk on crime in Latin America and talked at great length of the import role Mexico plays for the U.S. as part of the first resident course for the Distance Education Class of 2014. Four Army War College faculty experts on Syria, the region, and U.S. strategic processes will explore the complexities, the options, and the way forward for U.S. decision-making about Syria -- in a special Army War College panel discussion Sept. 11. For six centuries, history painting—pictures based on stories from myth, scripture, and ancient and modern history—was the most prestigious work a painter could do. Renaissance artists and writers laid down the definitions, goals, and rules. We outline these and look at many examples of how they changed as pictorial narrative evolved until its eclipse in the 19th century. Most of us know this famous image of an inspiring American defeat and a noble death. Trumbull was there that day. We examine what he knew about what actually happened at Bunker Hill, what he chose to paint, and what he wanted to say about the combatants' values. Los ordenadores personales son una herramienta requerida por los Ingenieros de Telecomunación, tanto para tareas genéricas (elaboración de documentos, gestión de datos, etc) como para el uso de herramientas de análisis y diseño (MatLab, Spice, etc). Elementos comunes a todo tipo de uso del PC son el sistema operativo, internet y los componentes hardware. Un conocimiento profundizado de estos aspectos permitirá obtener un aprovechamiento mayor de los recursos disponibles. Salmon Akhtar on The Trauma of Geographical Dislocation, how immigration can affect a person's mental health. Jordan Peterson on Slaying the Dragon Within Us. Peterson, a University of Toronto professor of psychology, talks about fear of the unknown and fear of dealing with problems. You see a really cute baby and you ask permission to touch him. When your hand gets close, will the baby laugh, cry or bite your finger? Tune in to learn Arabic in the best and one of the most fun ways available today! Inspired by last night's thunderstorm, our next poem is by Ф.И. 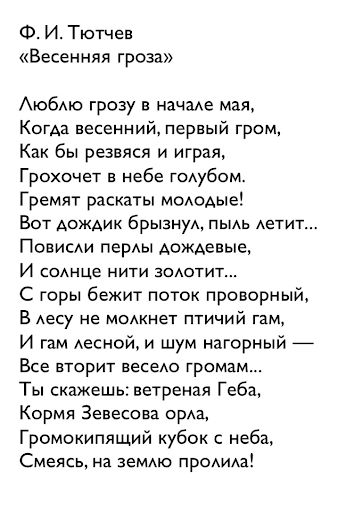 Тютчев "Весенняя Гроза".